Peru is not only the Machu Picchu and the Incas, during the 8 weeks we have spent in this country we have known and learned many things. 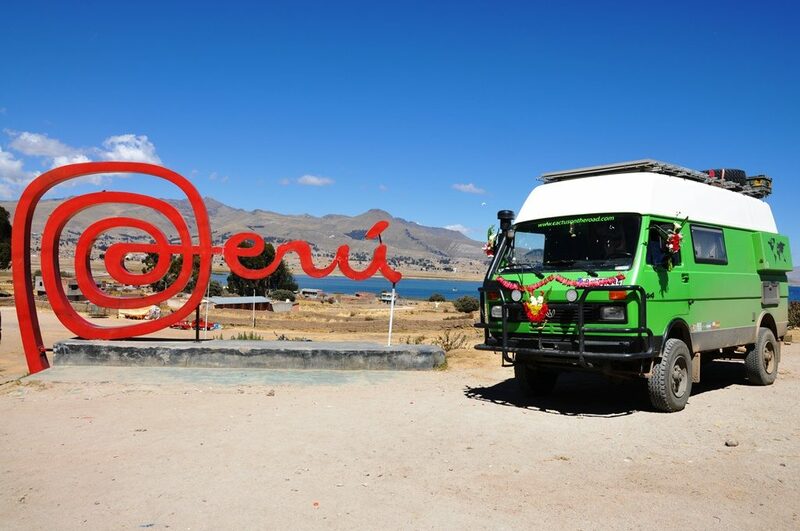 The route began in the region of Puno, we cross the border with Bolvia around Lake Titicaca. At that time we were sick, with a kind of gastroenteritis, which lasted for a long time… and that’s why we drove quite fast until we reached Cusco. There we could rest a couple of days before meeting my parents! They came to visit us for 2 weeks, we were very happy to see them, it has been 8 months since we don’t see each other! Although many temples were destroyed there are still many ruins to visit in the whole area of ​​Cusco and the Sacred Valley. There is a ticket called “Tourist Ticket” that allows you to access to 16 of these places and costs 130 soles (30 euros approx). If you want to visit some of them you are practically forced to buy it, because you can not buy individual tickets for each of the sites. From all the ruins we visit my favourites were two. Saqsayhuaman temple, with a large triple wall built with huge stones. And the ruins of Pisac where next to the village you can still see agricultural constructions in a rounded form, like an amphitheater. At some point of the trip we considered if it was worth visiting Machu Picchu or not because of the big “tourist trap” that is established around. But now with my parents here, it was clear that we had to see it! We are very happy with the decision despite all the mess… If you are thinking of visiting it and need information about how to do it, I recommend you to read this entry Practical information about Machu Picchu. Machu Picchu is a huge stone city built by the Incas in the fourteenth century and is surrounded by a georgius group of mountains full of vegetation. The citadel is preserved almost intact due to its location in the middle of nowhere. The spanish colonizers never find it. There are two types of buildings: the temples, sacred places and houses of rulers, that are built with huge stones embedded in right angles; and the “normal” houses that are build using smaller stones joined with mud. All the roofs were made of straw, so there is no trace left of them. During our visit it rained, it was cloudy, it was sunny and even the rainbow came out! Here you can see more pictures of the route from Titicaca to Machupicchu. From Cusco we crossed the Andes in a tough three-day route until we reached Nazca. There, we visited the mysterious Nazca Lines. These are some lines drawn on the earth with different shapes, geolyphs, and these are only visible from the air. The geoglyphs were drawn by the Nazca culture, calculated between 100 and 600 AD. How and why they were made is still a mystery … We jumped in a light aircraft and we enjoyed the view of the most important geolyphs. The experience was very good and fun! From Nazca we continue to Ica, where we visit the Oasis of Huacachina, surrounded by huge sand dunes. This is a dream village, in the center of which there is a quiet lake, surrounded by palm trees, houses and very nice hotels. We stayed in one of them, with a beautiful garden and pool! We climbed the dunes in a buggy and tried some Sandboard! 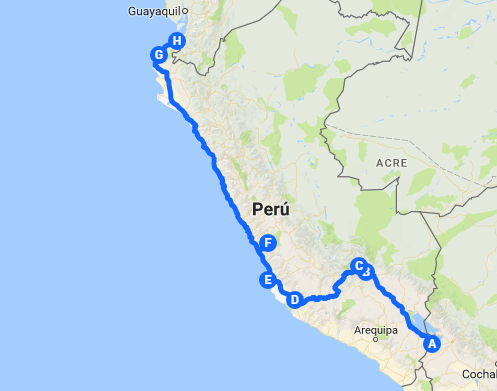 From there we followed the route north along the coast, the next stop was Paracas. There, we visited the Paracas National Park, and the Ballestas Islands. We saw colorful deserts, huge beaches, rock formations, birds, many birds, sea lions and some penguin. In this area of ​​Peru the sea is very rich in phyto and zoo planckton and this increases the presence of fish and consequently of birds. I have never seen so many birds together in my all life, it was amazing! We stayed with the van in the neighborhoods of Miraflores and Barranco, this are beautiful and secure! We visited the center of Lima and made part of the “Ruta del Pisco”, which included the hotel Maury, where the first Pisco Sour* of history was prepared in 1837. *A pisco sour is an alcoholic cocktail of Peruvian origin. The drink’s name comes from pisco, which is its base liquor, and the cocktail term sour, in reference to sour citrus juice and sweetener components. The Peruvian pisco sour uses Peruvian pisco as the base liquor and adds freshly squeezed lime juice, simple syrup, ice, egg white, and Angostura bitters. We said goodbye to the family and before following the route north we met Alfieri, a man who bought a VW LT 40 4×4 a few months ago, what a coincidence! We changed our route to the north due to the disease, the last thing we needed was to suffer altitude sickness again … We missed the white mountain range, called the most beautiful mountains of Peru, but instead we discovered really interesting archaeological sites. You can read more about this in the entry Archaeological sites of the Peruvian coast. Then we arrived at the Órganos beach where we would do one of the most spectacular things of the trip! We met there Lidia and Javi from Vantravellers. We did a whale watching tour and it was awesome! We saw dolphins, sea lions, birds and huge whales jumping a few meters away! In the boat we were accompanied by other tourists, the captain and two biologists, who explained many things to us. Whales pass in front of the Peruvian coast at this time of the year because they are returning from the warm waters of Central America, where they mate and have their young, and head towards Antarctica, where they usually live. Mothers always accompany their young throughout the journey, while the parents do not, what is sometimes observed are male whales that experts call escorts, who accompany them during part of their journey. During the days we spent in Órganos we enjoyed the sea, the sun and the good company, we were joined by 3simpeslocos and Logoali. We swam with turtles, fished, did yoga, barbecues and mojitos 🙂 what else could you ask for ?! We continue north and settle in Máncora, the most touristy of the northern beaches. We were very comfortable and quiet for about 2 weeks we spent there, resting, sunbathing, eating fresh fish and seafood, strolling along the beach and trying to surf! 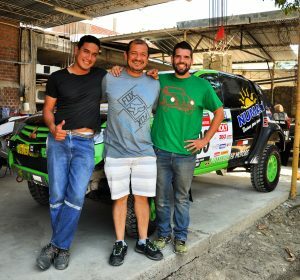 (We are not very good at :-() We also met with great friends like Marce and Carlos from Travelcafeespecialcolombia and Walter with their Trusty truck, we also met other Chilean, Argentinean and Uruguayan travelers and had good times together. The last stop before leaving Peru was at the SwissWassi campsite in a beautiful place on the beach and with all the comforts. We took the time there to clean Cactus, wash sheets, quilts and curtains and work on the web … We also enjoyed the beach and the delicious coconuts! And from there we made an excursion to the mud baths of the Hervidero, where we lived an unforgettable experience, that of frolicking in the mud like a pig! Hahaha. Here you can see more photos of Lima and the north of Peru.